Inspired by the Gothic/Romantic literary tradition as well as by contemporary prose poetry. After the snowstorm. I step outside into the unrecognizable ivory world. Different shades of white blanket the landscape – not pure but tinted, painted, dyed. Sparkling silver under the feeble sun, a touch of damask on a distant ridge, deep sapphire lurking in the shadows. The nearby wood a sinister wall of sentinels watching the manse. A blast of frigid wind strikes me suddenly, I stagger backwards but do not fall. Snow lifted violently from the ground wraps itself around me like a shimmering, freezing mantle. The cold engulfs me. All is silent. A silence so deafening that it bears down on me, oppressive and frightening. Wishing for sound, I tread on the crystalline snow, my feet breaking through the thin film of ice with a comforting crunch. I distance myself from the sprawling, charcoal estate, sluggishly approaching the wild wood. The noise of my footfalls saturates me. Until I stop. Halfway through the clearing I pause to catch my breath. A screech penetrates my concentration. I start, my heart quickens, my breath suddenly comes up short. Terror seizes me, its unrelenting icy grasp slowly asphyxiating me as I frantically search the surroundings. Again, but this time a piercing scream, echoing in my mind. My legs are moving, the forest draws nearer – I am running, trying to escape. The writhing, untamed trees reach towards me. Dark branches claw and cut. Falling on the frosty forest floor. Categories: Writing | Tags: gothic, horror, mansion, prose poem, romantic, snow, terror, trees | Permalink. For the first time in 30 years a museum in the United States is hosting a exhibit dedicated solely to German Impressionism. This fact makes “A Variation of Impressionism” particularly relevant and it hopefully will introduce people to a facet of painting with which they are not particularly acquainted. Most Americans are familiar with French Impressionism but not with German Impressionism, a topic Professor Deshmukh touched upon in her lecture. During the 19th century and beginning of the 20th century, Americans often visited France and bought Impressionist artwork. Consequently, American museums (taken as a whole) have strong collections in French Impressionist artwork. Impressionism came to Germany late, mostly due to the tense political relations between France and Germany following the Franco-Prussian War. When Impressionism finally began flourishing in Germany, the artists adhering to the movement had to overcome an unsupportive government. The German government preferred the more traditional classical school of painting, refusing to exhibit German Impressionist artwork. Despite such setbacks, artists continued to produce Impressionist artwork and a new style of Impressionism was born in Germany. The artists Lovis Corinth, Max Liebermann, and Max Slevogt formed the Triumvirate of Impressionism. One of my favorite paintings on display in the MFAH is Liebermann’s Country House in Hilversum—Villa in Hilversum (1901). The composition is particularly striking in that Liebermann uses a large tree to cut through the canvas, both obfuscating and framing the house. The house is truly integrated into the painting and although it is the focus, it does not dominate the canvas. The architecture does not fight against the natural surroundings. Categories: Theory, Visual Arts | Tags: 1900, Berlin, German Impressionism, history, Lovis Corinth, Marion Deshmukh, Max Liebermann, Max Slevogt, MFAH, museum, oil, painting, Terrace in the Garden near the Wannsee towards Northwest, Triumvirate of Impressionism | Permalink. It is the first of a series of three animal paintings. 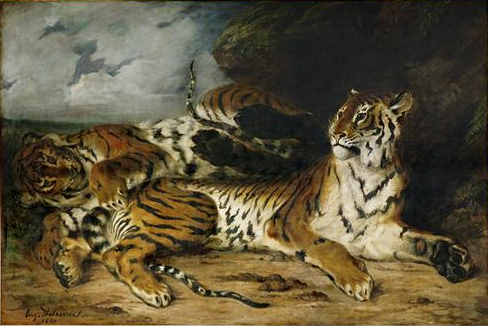 I am drawn to early 19th-century European tiger paintings, such as Eugène Delacroix’s A Young Tiger Playing with its Mother (1830). For the landscape, I was inspired by early paintings of Brazil such as Frans Post’s Franciscan Monastery of Igaraszo in the Brazilian Landscape (1640). Another painting of note is Brazilian artist’s Juan Leon Palliere’s Landscape of the Jungle of the Argentine Missiones Province (1864). There is something unknown and unknowable in the jungle-scapes of these paintings. I was drawn to that emotion and placed it into my own painting’s landscape. I look back at a time when much of the world was unexplored or in the process of being explored. There is something simultaneously seductive and dangerous in that uncertainty. Categories: Images, Visual Arts | Tags: animal, Delacroix, Eugène Delacroix, feline, forest, Franciscan Monestrary of Igaraszo, Frans Post, Juan Leon Palliere, jungle, Landscape of the Jungle, oil, painting, tiger, Tiger Playing with its Mother, white tiger | Permalink. I was recently contacted to do an illustration for a Guy Pearce interview in Bullett Magazine’s premier issue. One of the most exciting parts of this project is that my drawing is the only illustration in the magazine. The published drawing can be seen in my portfolio. Categories: Images | Tags: actor, Bullett, Bullett Magazine, drawing, graphite, Guy Pearce, illustration, ink, military jacket, pen, portrait, watercolor | Permalink. The self-portrait I posted a few days ago got me thinking about memories and the instability of our memories. Those ideas coalesced into this short, semi-autobiographical essay. Sitting crossed legged on the cold floor, I hunched over a stool with a black pencil in my left hand. My older sister sat next to me and watched my progress. I pronounced each part of the word separately, delighted in both the sound and its presence on the page. That was the first word I wrote: spindly letters aligned to the blue line of the page. My infantile markings, produced with an unwavering attention to detail, covered several faded notebooks. My sister had drawn guidelines in the notebooks for me, allowing me to practice letter after letter until she deemed me ready to write full words. Textbooks say that memory consolidation does not occur until a child turns three. But perhaps if an emotion is sufficiently strong, a moment in time will take hold sooner. I was two years old and my sister was eight but in my memory, she seems much older, much larger. In some ways, she is more like a blur, a presence of undying support that does not really have corporeal form. I know she is there and that is what matters. Of course, if I focus on her within the memory-space, I can conjure an image. This image, however, is an amalgam of the original memory blur, old photographs I recall, and my sister as she currently is. Trying to grasp a concrete version of my sister-in-memory is not an easy task and ultimately leaves me unsatisfied because I know something is missing. This inability to conjure a precise memory-image and my simultaneous acknowledgment of this, results in an uncanny valley within the memory. The uncanny valley inside the memory does not limit itself to my sister but pervades all objects (animate or inanimate) within the memory-space. Even the most significant players of the memory are unable to withstand visual scrutiny. For example, the black pencil was most likely a thick crayon because two-year-olds do not have sufficient muscle-control to handle a pencil. Nevertheless, inside the memory, I am convinced the object I hold in my hand is a pencil. The memory collapses into the uncanny valley when I single out the pencil, a move which essentially transplants the pencil from the memory-space into a blank brain-space. I realize that the pencil is self-manufactured when it becomes a Staedtler art pencil, a brand I only discovered when I was in middle school. Knowing that the Staedtler pencil cannot possibly exist within my memory, I am overwhelmed with a feeling of discomfort and panic. The memory is corrupted and its pristine form is irrecoverable. Only by pulling away from objects and seeing the memory unfold in a gauzelike haze can I regain stability. The memory exists as its own entity somewhat apart from the concrete logic of the present. In this way, memories are like dreams: they are outside of real-time, resist accurate recall, and invite revision and embellishment. The most precise aspects of memory-space and dream-space are the emotions. This first memory has probably undergone massive revisions since the actual event occurred. It is a well-worn memory and its constant use has changed its surface. This is why my sister is never the same sister: she is always blended with a current version of herself. The pencil is whatever pencil I happen to be using for my artwork. The beauty of the memory-space is its seemingly inevitable convergence with the fictive dream-space. Categories: Theory | Tags: dream, dream-space, memory, memory consolidation, memory-space, object, objects, Staedtler | Permalink. This self-portrait challenges the notion of time. I try to break free from the idea that the self portrayed is necessarily contained within a specific time. My gaze is wearied, as if with age, and my hair is possibly graying. Yet, my skin is flawless – suggesting a super-human youth. I emerge as if from shadows but am illuminated by a strange, ethereal light. The faint suggestion of a background heightens the temporal uncertainty of the image. I was informed by Walter Pater’s description of La Gioconda in his book The Renaissance. The presence that thus rose so strangely beside the waters, is expressive of what in the ways of a thousand years men had come to desire. Hers is the head upon which all “the ends of the world are come,” and the eyelids are a little weary. It is a beauty wrought out from within upon the flesh, the deposit, little cell by cell, of strange thoughts and fantastic reveries and exquisite passions. Set it for a moment beside one of those white Greek goddesses or beautiful women of antiquity, and how would they be troubled by this beauty, into which the soul with all its maladies has passed! All the thoughts and experience of the world have etched and moulded there, in that which they have of power to refine and make expressive the outward form, the animalism of Greece, the lust of Rome, the reverie of the middle age with its spiritual ambition and imaginative loves, the return of the Pagan world, the sins of the Borgias. She is older than the rocks among which she sits; like the vampire, she has been dead many times, and learned the secrets of the grave; and has been a diver in deep seas, and keeps their fallen day about her; and trafficked for strange webs with Eastern merchants: and, as Leda, was the mother of Helen of Troy, and, as Saint Anne, the mother of Mary ; and all this has been to her but as the sound of lyres and flutes, and lives only in the delicacy with which it has moulded the changing lineaments, and tinged the eyelids and the hands. The fancy of a perpetual life, sweeping together ten thousand experiences, is an old one; and modern thought has conceived the idea of humanity as wrought upon by, and summing up in itself, all modes of thought and life. Certainly Lady Lisa might stand as the embodiment of the old fancy, the symbol of the modern idea. Pater’s passage on the Mona Lisa redefined the painting’s significance and introduced a new way of approaching artwork. Pater, as the critic, can superimpose his own ideas and experiences onto an art piece. In The Renaissance Pater argues, among other things, that the critic is allowed (in fact, supposed to) re-imagine all artwork placed in front of him. Oscar Wilde took this notion and expounded upon it in his dialogue The Critic as Artist. Categories: Images, Theory | Tags: aesthetic theory, artist, Critic as Artist, decadence, drawing, graphite, La Gioconda, Mona Lisa, Oscar Wilde, portrait, Renaissance, self-portrait, Walter Pater | Permalink. As every good academic, I enjoy placing meaning in every level of my work. This blog is no exception to that unbelievably impractical, yet momentously gratifying, method. I see this blog not as a mode of documentation but as an art piece that is constantly in flux. Neo-Decadent uses a global medium of communication and invites people to participate in the creation of a Paterian denial of theory, organization, and constancy. The blog embodies the desire for constant change and the ability to endlessly expand horizons through a rhizomatic structure (for more on rhizomes read Mille Plateaux by Gilles Deleuze and Félix Guattari). I first used the term Neo-Decadent when working on my thesis at Cornell. My obsession with Oscar Wilde and Aestheticism made the adoption of such a term natural to me. The late 19th-century exerts a certain inexplicable magnetism over me and I have immersed myself in its literature and culture. Consequently, the Decadent sensibility has found itself re-imagined in my artwork – thus, I create Neo-Decadent art. The subtitle, “The Art and Opinions of Heidi Celeghin, Aesthete,” derives from the 18th-century novel The Life and Opinions of Tristram Shandy, Gentleman by Laurence Sterne. Sterne’s novel is a fascinating and absurd exploration of narrative and physical narrative space. Since I play with these ideas in my artwork, it seemed appropriate to make a reference to one of my sources of inspiration. Furthermore, the subtitle, in referencing a work of fiction, reveals the extent to which an artist’s identity is fabrication. The artist becomes a work of art because his/her life is constantly being self-fashioned. Categories: Theory | Tags: Aesthete, Aestheticism, Culture and Schizophrenia, Decadent, Félix Guattari, Gentleman, Gilles Deleuze, introduction, Laurence Sterne, Mille Plateaux, name, Neo-Decadent, Oscar Wilde, rhizomatic structure, rhizome, The Life and Opinions of Tristram Shandy, Walter Pater | Permalink.